Today it rained and it poured and it did my soul good. For, you see, when it rains like this, it seems as though things slow down. My soul quiets, and I take a deep breath. I even let myself pick up a book in the middle of the day on rainy days every now and then. Besides they say the sun will be out tomorrow, so I know it’s not an indefinite flooding going on here. I can enjoy a rainy day or two every now and then. Especially on those rainy days where I don’t have to be anywhere or meet a deadline or anything like that. This afternoon I walked by the window in the living room a few times and had to do a double take. The new green leaves on the tree right outside the window are such a bright green that they almost glow. They made me think the sun was shining they were so vivid. Ah. I love that book. Years ago I put together storytimes for the local library system and I traveled to different child care centers and read and shared stories, poems, and rhymes there and at the libraries. 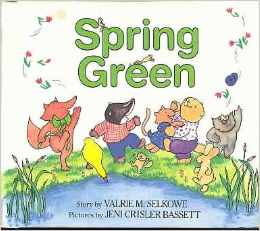 One of my favorite books to share in March or April was “Spring Green” by Valrie M. Selkowe and Jeni Bassett. It’s a simple and delightful story about Danny and his animal friends who are all invited to a party and need to bring something green with them. Danny looks and looks and has such a hard time. And in the end, it turns out it’s not so much what you have but who you have in your life that matters the most. It didn’t occur to me until tonight that this is why I love this story so much. I expect that is why Mama loved having it on her shelf all those years–it’s something she’s known all along. I’m a bit of a slow learner, but I know that truth now. If you have a few extra dollars and can order yourself a copy of this book or can find it at the library, I highly recommend it. A sweet and quick read. And the message can’t be beat. All about the who, not the what. Tonight I’m thankful for all of my who’s out there. And for the us that the who’s in my life put time and love and energy into growing. Love to all. Wishing you all a day full of light tomorrow.